Eastleigh ended a run of five league games without victory by defeating Eastbourne Borough by two goals to one this afternoon. It was a positive way to react to the 6-1 mauling at the hands of Boreham Wood last weekend. Three changes were made to the starting eleven with Tom Jordan, Danny Smith and Damian Scannell replacing Ben Wilson, Jamie Brown and Scott Rogers. The first action of the game saw Eastleigh conjure up an excellent free-flowing move to carve open the visiting defence. Chris Flood carried the ball forward before combining down the right with Damian Scannell. The attack continued with Bradley Bubb playing a neat one-two with Lee Peacock inside the penalty area. Bubb found space and had a clear sight at goal where Clark Masters was forced into an early save. Ian Baird's Spitfires will look to get back to winning ways today as they take on Eastbourne Borough in the Blue Square Bet South at The Silverlake Stadium (3pm kick off). Eastleigh have failed to win in their last five games in the league having lost four and drawn one which has destroyed their play-off hopes this season; and with a heavy defeat away to Boreham Wood last Saturday, The Spitfires will be looking to get a good result for the fans. The Spitfires travelled to Meadow Park last Saturday where they had a difficult task against The Wood and it took just eight minutes before the hosts took the lead through Callum Reynolds who headed home former Spitfire Graeme Montgomery's cross. David Bryant doubled The Wood's lead just three minutes after the break before Graeme Montgomery tripled their lead after beating keeper Jack Dovey on a one on one breakaway. Eastleigh FC are delighted to announce a massive reduction in season ticket prices for next season. Having committed to an increased playing budget for the 2012-2013 season, which should enable us to compete for honours, it is the club’s desire to try and attract as many fans as possible to the Silverlake, in what we hope will be a memorable season. Matchday ticket prices will remain largely unaltered, but as a reward to our loyal fans, and in the hope of attracting many new followers, the club have come up with what we are sure will be an attractive proposition. The ‘early bird packages’ are great value for money, making games much more affordable and representing excellent value for money in these ’tough times’. IAN Baird is the right man to lead Eastleigh to promotion next season. So says Tommy Widdrington, who takes his Eastbourne Borough side to the Silverlake Stadium tomorrow. Widdrington was linked with Baird’s job last year, but joined the Blue Square South with Eastbourne two months ago and has steered them away from the relegation zone in recent weeks. “That was 12 months ago, Eastleigh’s a club I know well from my time with Salisbury but there are new people there now and Ian has done a good job,” said Widdrington. “Ian’s teams are always well drilled and strong, he’s got a proven track record in this league and more often than not he’s finished in the top half. There have been calls for Baird to be replaced as manager following last week’s 6-1 drubbing at Boreham Wood. BOSS Ian Baird has hinted that a season of unrest at Eastleigh contributed to Saturday’s deeply embarrassing 6-1 collapse at Boreham Wood. It was the Spitfires’ fourth defeat in five win-less league matches and did nothing to boost the claims of players who are meant to be fighting for contracts for next season. The scale of this defeat combined with three straight home losses has prompted calls for Baird's head on the fans' forum and some are suggesting that last week's resignation of much respected chairman Paul Murray can only be damaging to the club. In Baird's opinion, events off the field are now taking their toll on performances on it. He said: "There's lots gone on at this football club that people don't know and probably never will. “It seems to me that a few of the players have downed tools because of what’s been going on. It seems hard to imagine that ten days ago Eastleigh F C were talking of aiming for the play offs and a genuine good feeling about reaching the play offs. That is now almost mathematically impossible despite six more fixtures still to contest, but not even the eternal optimist could now believe that Eastleigh could clinch that last place. On a run of form that has seen Eastleigh only collect four points from a possible twenty-one, averaging only a goal a game on the for column, it was a despondent Eastleigh side that trudged from the Meadow Park Boreham Wood arena following this five goal mauling, with Boreham Wood leapfrogging Eastleigh in the league table as a result. ANDY FORBES has been rewarded for an inspired season by signing a year's extension to his contract, keeping him at Eastleigh until the end of 2012/13. It's not often Spitfires boss Ian Baird waxes lyrical about a player, but he readily admits the 32-year-old striker-turned-defender has been "outstanding" and set a shining example to other members of the squad whose contracts run out this summer. Three straight home defeats have all but extinguished Eastleigh's faint play-off flame, but Forbes has never let his high standards slip. Baird, bitterly disappointed with the naivety that led to Tonbridge snatching a late 2-1 victory at the Silverlake on Tuesday, said: "I want us to have the best and strongest finish to the season that we can. "I don't want to get the Factor 20 out and think I'm on holiday - and I don't expect the players to either. Eastleigh Football Club announce the resignation of Chairman, Paul Murray, who is standing down with immediate effect. Paul says, “As some will know, I recently sold my shares in Eastleigh Football Club when the Directors of Bridle Insurance were acquiring a majority stakeholding in the Club. I also stood down as Chairman at that time to assume the role of Non Executive Chairman. However I feel that it is now time for me to move on. 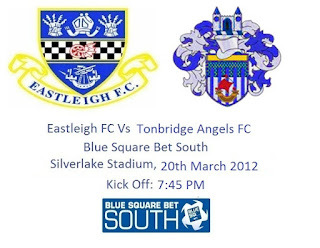 I have thoroughly enjoyed my involvement with Eastleigh Football Club over many years. I lived in Eastleigh as a teenager, I went to college in Eastleigh, I have worked in Eastleigh for 46 years and still work here. I have a great affinity for the town and have therefore have been pleased to be of service to the local football club. For the most part, it was an end-to-end, open game - one that Eastleigh looked to be edging on the balance of play. The result didn't entirely reflect the performance as the Spitfires went down to a third straight home defeat, but the manner of the loss was disappointing and a bitter pill to swallow. Conceding twice in the last ten minutes (having led 1-0 for the majority of the second half), Ian Baird's side were undone in stoppage time by a killer blow. Ian Baird’s Spitfires suffered back to back league defeats on Saturday which all but certainly destroyed their promotion push this season. Dover opened the scoring after much possession from Eastleigh. A corner was flown in for the unmarked Billy Bricknell to fire into an empty net after Jack Dovey made a rare mistake in failing to claim the ball. Just five minutes later, Bradley Bubb latched onto a tackle from Chris Flood and the on loan Aldershot striker returned it to Flood and the winger tucked the ball away past Mikhael Jaimez-Ruiz to equalise. Eastleigh’s joy only lasted for three minutes when Dover’s Barry Cogan whipped a free kick in from the left wing and some how found the back of the net leaving on loan Southampton goalkeeper Jack Dovey left standing. MUCH as Eastleigh boss Ian Baird is looking forward to doing battle with AFC Totton at St. Mary's in May, he has grave reservations about the date of the Hampshire FA Senior Cup Final. An 85th-minute Jamie Slabber penalty secured the Spitfires a 1-0 win at Winchester City on Wednesday night to secure them a place in the county's showpiece season finale. But what bothers Baird is that the May 16th showdown against Stuart Ritchie's Southern Premier promotion seekers comes two-and-a-half weeks after the end of the Blue Square Bet South campaign. And, with Eastleigh's play-off hopes almost certainly over, he thinks it highly unlikely that some of his players will still be around by that time. "The issue I have is that the players' contracts run out on the last day of the season. Eastleigh FC have today received a further offer from Chelmsford City for striker Jamie Slabber. Having had their initial approach declined, Chelmsford have doubled their offer. Jamie made it clear, that if the offer was acceptable to Eastleigh he was keen to talk to Chelmsford, on the basis they are a big club and only 20 minutes from his home. Whilst the offer is still slightly below our valuation, we are aware that on a personal note for Jamie, it is an appealing move. On that basis we have allowed him to talk to Chelmsford today. He has agreed personal terms and will complete his move, subject to a medical tomorrow. Jamie has been a model professional during his time at the club and we would like to take this opportunity to thank him for his service and wish him well for the future. The Spitfires' hopes of reaching a play-off place this season are now all but extinguished after a home defeat at the hands of Dover Athletic. 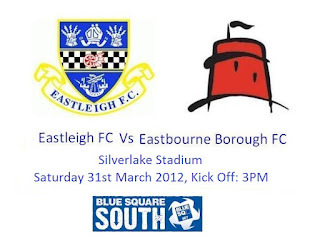 Eastleigh have lost ground on fifth place in recent weeks with today's defeat meaning back to back home losses at the Silverlake Stadium, leaving Ian Baird's side without a win in three Blue Square Bet South games. Eastleigh were without several key members of the squad including captain Tom Jordan, who suffered concussion in the Hampshire Cup semi-final win over Winchester on Wednesday. Also absent from the squad were suspended midfield-duo Danny Smith and Philip Appiah, injured Damian Scannell and influential midfielder Daryl McMahon who is still in Dublin due to family reasons. Ian Baird’s Spitfires reached the final of the Hampshire Senior Cup after a late penalty at The City Ground on Wednesday. The Spitfires could only name four subs as Jack Dovey, Daryl McMahon, Philip Appiah, Damian Scannell, Bradley Bubb and Lee Phillips were all ruled out for various reasons. It took only 14 minutes before captain Tom Jordan suffered a bump to the head. The club later received news that Jordan had concussion which could see him ruled out for the next two games. Ian Herring, who has recently returned to the squad following a loan move at Chippenham Town, replaced Jordan. Eastleigh were dealt a further injury scare when, seven minutes before the break, centre back Gary Elphick turned his ankle and hobbled of the pitch to be replaced by Jordace Holder-Spooner. Eastleigh Football Club would like to welcome experienced striker Lee Peacock to the club for the remainder of the season. The striker, who can also play in midfield, will be immediately available for selection and could be seen gracing the Silverlake for tomorrow’s important match against sixth place Dover Athletic. Manager Ian Baird comments: “We’re trying to get competition for places and Lee fits the profile we’re looking for. He’s the sort of player we want around the dressing room.” Peacock has been training with the Spitfires having recently relocated to the Hampshire area and Baird continued: “He feels rejuvenated and wants to give it a go and try and earn a contract here for next season”. Eastleigh are through to the Hampshire Senior Cup Final where they will face AFC Totton following a 1-0 win over Winchester City by a single goal this evening. In a game bereft of clear cut chances for so long, the tie was finally settled when Chris Flood won a penalty five minutes from time after rounding the City goalkeeper and being pulled down in the area. JAMIE SLABBER stepped up confidently to score from the spot and ensure that there would be no need for extra time by sealing victory inside normal time. The win came at a price though as an already depleted Spitfires side without the services of Jack Dovey, Daryl McMahon, Philip Appiah, Damian Scannell, Bradley Bubb and Lee Phillips; lost two more players to injury in tonight's game. THE fainter Eastleigh’s chances get of gate-crashing the Blue Square Bet South play-off places, the more certain Ian Baird becomes of what needs to be done to put it right next season. By the manager’s own admission, the Spitfires were lucky to escape with a point from a 0-0 draw at sixth-to-bottom Bromley – the home side missing a penalty three minutes from time. “We didn’t play well attacking-wise in bumpy, difficult conditions and it wasn’t pleasing on the eye, that’s for sure,” said Baird. "They missed a penalty and also had two penalty claims turned down which, on a different day, might have been given. "I've got to say we were fortunate, but in my tenure at Eastleigh we haven't had a lot of luck, so perhaps we were owed some. "Much as we were poor in attack, I was really pleased with how we played defensively. Eastleigh had to make do with a point and a clean sheet in a goal less draw away at Bromley, who missed a late penalty. Ian Baird’s Spitfires finally lost at home in the league last Saturday against Hampshire rivals Farnborough when they fell to a 0-1 defeat at the Silverlake Stadium. Eastleigh played five at the back giving Michael Green a return at left back however winger Damian Scannell was left out of the starting line up owing to illness and new signing Lee Phillips replaced striker Jamie Slabber. With both teams in very good form, it took 57 minutes for the Yellows to break the deadlock. Right back Mitchell Nelson made a challenge on striker Michael Charles and referee Barry Holderness awarded a penalty. Striker Phillip Page converted the penalty putting the visitors in front. Substitutes Damian Scannell and Jamie Slabber replaced Michael Green and Lee Phillips but Farnborough’s defence was too good as the Spitfires were defeated at home in the league for the first time in twelve games. Eastleigh insist Jamie Slabber is going nowhere – despite a sudden surge of interest in the Spitfires’ top scorer. Manager Ian Baird’s decision to drop Slabber to the bench last Saturday and hand a debut to new signing Lee Phillips from Bath City appears to have sent out a message to rival clubs that the 27-year-old’s Silverlake days could be numbered. When Slabber joined Eastleigh from Woking in June 2010, Baird described it as the “last chance saloon” for the former Tottenham, Swindon, Aldershot, Grays, Stevenage and Havant frontman, whose stop-start career had been blighted by injury. Slabber repaid Baird’s faith by finishing as the Spitfires’ top scorer last term and he agreed to stay on last summer after many of the club’s senior stars had departed and made way for up and coming youngsters. Eastleigh Football Club is thrilled to announce yet another exciting development with current sponsors A&A Business Supplies Ltd. The Southampton based Stationers have generously agreed to substantially increase their current sponsorship deal and in addition, supporters, players and staff who arrange any stationery orders will see a healthy proportion of the order returned to the football club. Having seen a similar scheme work so successfully with main sponsors Bridle Insurance, we are again calling out for all fans and staff to get behind the scheme and support our next project. EASTLEIGH boss Ian Baird was adamant that Saturday's potential promotion-killing 1-0 defeat to Farnborough had nothing to do with the system he played. The Spitfires were undone by a second half Phillip Page penalty, dropping them to ninth in the Blue Square Bet South and losing them further ground on fifth-placed Sutton who grabbed a late winner at Thurrock. With the livewire Damian Scannell not well enough to start, Baird went with five at the back, entrusting Mitchell Nelson and the recalled Michael Green with the task of getting forward as attacking wing-backs. But Farnborough got bodies aplenty behind the ball and, by Baird's own admission, the Spitfires were "not good enough to break them down." It left some Eastleigh fans to question why a side boosted by a raft of quality signings had not been more adventurous on home soil, where they had been unbeaten in their previous 11 league games. "It's not about systems," said Baird.